She fell in love, head over heels…with two brothers. They met on our vacation in Hawaii. Their names? Loco & Moco. Two potbelly pigs living the good life at our resort in Maui couldn’t have better names. Loco moco is delicious – remember when I had to make Short Ribs Loco Moco after one of our trips? But yes, my daughter fell in love with these potbelly pigs, and I could see why. They were larger versions of our Wilbur, our English bulldog who snorts and roots at his dinner much like a pig, his squashed up tail wiggling when he feels like running. It changed her, though. The resort’s intent to teach the children about the significance of the domesticated pig to the Hawaiian’ culture, from its value as a food source to its company as a pet made an impression on my daughter. She decided she was no longer going to eat pork. I support her decision, and several weeks since our return, she has stayed true to herself. No bacon, no prosciutto, no sausage, none of it. All things I know she used to love. I admit that it has made meals more challenging for me, as we love pork and eat it so much! Respecting her wishes has meant extra cooking for me. It also meant some sadness that she wouldn’t eat this Slow Cooker Stout Pulled Pork. There was a time when she loved pulled pork sandwiches, but she wouldn’t budge. Not for Loco & Moco. Not for pigs everywhere. Ah well, perhaps one day she will change her mind. 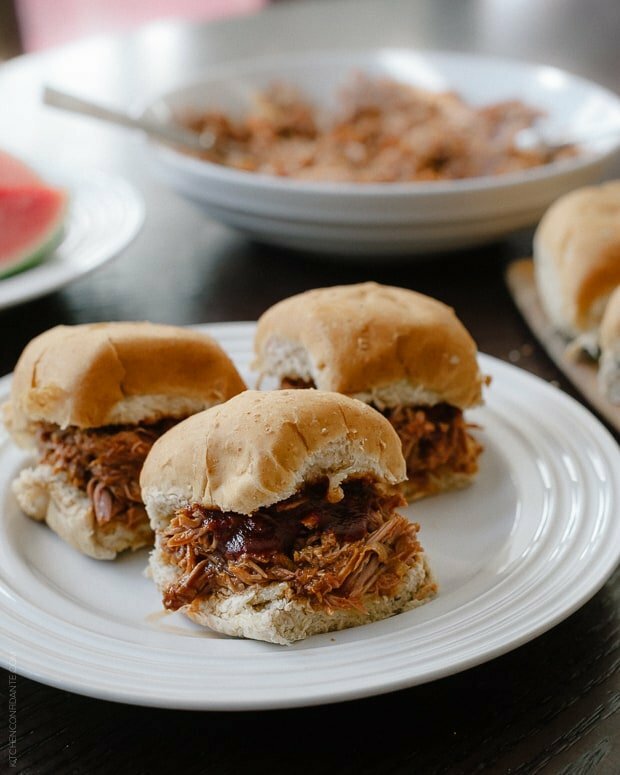 For now, we had extra helpings of this Slow Cooker Pulled Pork, and that’s ok. It’s amazing in pulled pork sandwiches, slathered with barbecue sauce. It’s also good with a helping of rice and beans. Or in a breakfast tortilla. I can’t give it up, that’s for sure. Set it and forget it. I love how the slow cooker works its magic with minimal effort! 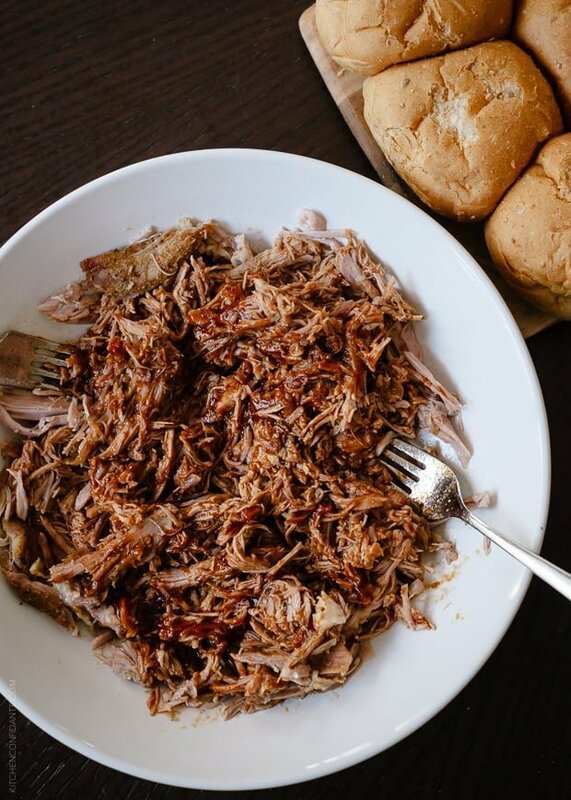 But what I love even more is how you can find endless ways to enjoy this pulled pork. Put them in tacos, burritos, sliders, breakfast casseroles...the possibilities are endless. Place the onions and garlic in the bottom of a slow cooker insert. In a small bowl, combine the chili powder, salt, cumin, coriander and brown sugar. 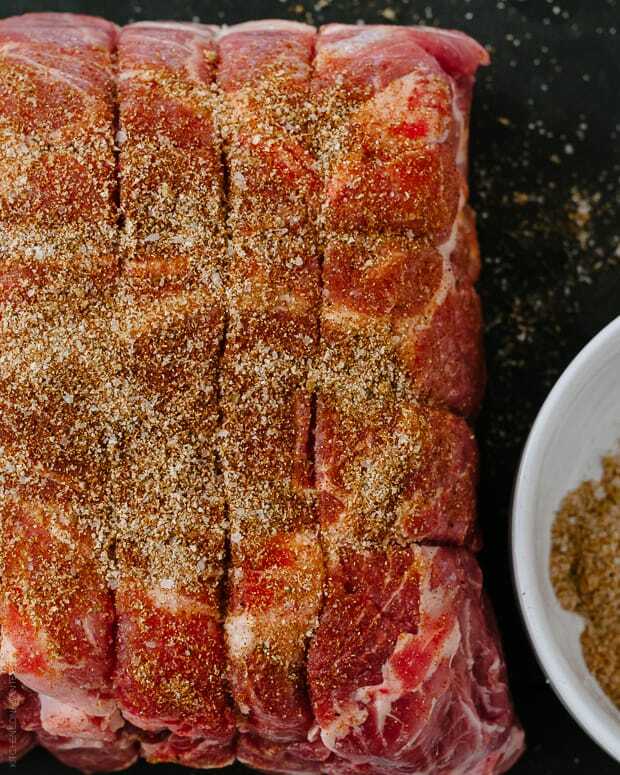 Rub the pork shoulder with the spice rub on all sides. 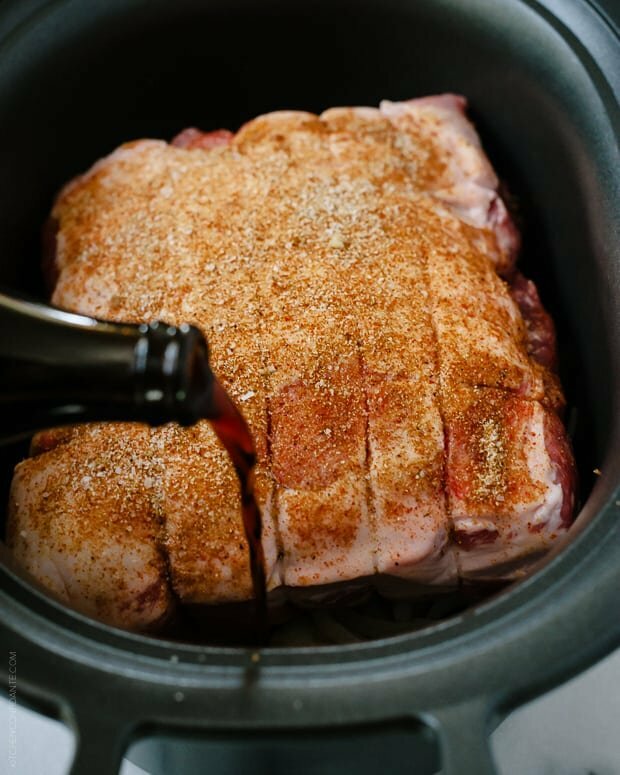 Place the seasoned pork shoulder with the fat side up on the bed of onions in the slow cooker. Pour in the stout, orange juice and chicken stock. Cover and set the slow cooker for 6 hours on high or 10 hours on low, or until the pork is fork tender and coming apart. If possible, rotate the pork shoulder once during cooking (this helps, but is not necessary). Once cooked, carefully transfer the pork to a cutting board. Shred the pork using two forks, and discard any fat. If you wish to serve with barbecue sauce, stir in it in at this time. 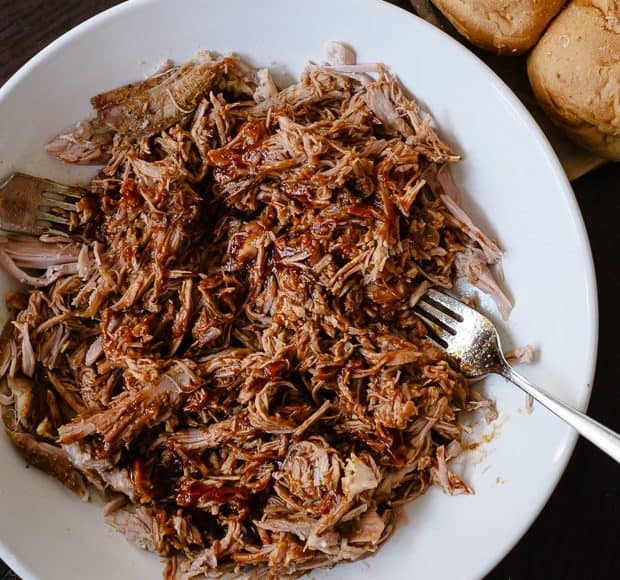 If you are planning on using the pulled pork for another recipe, season to taste with salt and pepper, and place in a bowl. Strain the liquid remaining in the slow cooker and use a bit of this liquid to keep the pulled pork moist. I love how you flavored these, they sound so good and the perfect way to end the weekend! Looks amazing – so tender and flavourful! This is an awesome recipe, filling and comforting. Now that’s a piece of pork!!!! 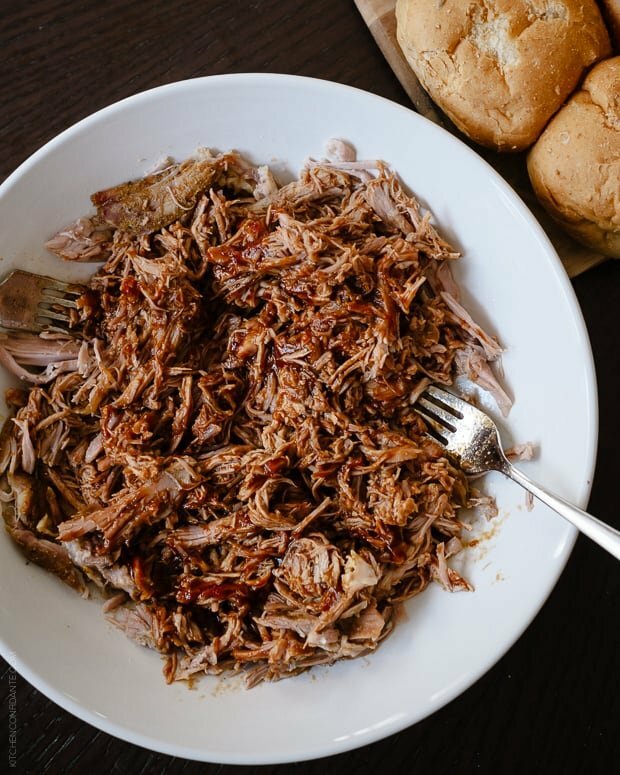 love me some slow cooked pulled pork! Do you think I could make this with a brisket instead of pork? The flavors seems like they would complement beef as well. I’ve never tried, Susan, but do think it’s worth a shot! Let me know how it turns out if you do! Yum yum, i love burritos, this one looks good, Thanks for sharing this recipe. Any thoughts on how I would make this in the oven as opposed to a slow cooker, in terms of oven temp. and time? Hi Danielle, I would try it low and slow – about 325 degrees F, for about 3-4 hours, or until tender. I hope that helps!